Come see Casa Guadalajara’s Altar for Día de los Muertos! Día de los Muertos is a joyous festival when the memory of loved ones and the continuity of life are celebrated. Traditionally, altars are set up that include favorite items of the departed, such as drinks and food. Special skull-shaped candies and breads are also prepared for the occasion. 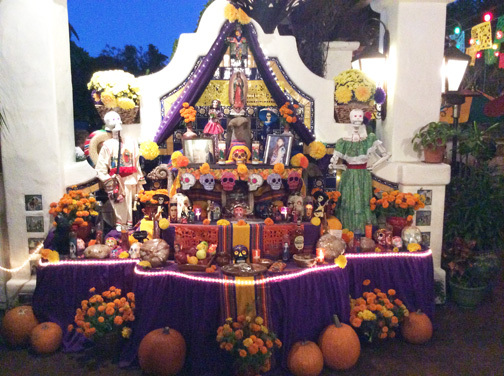 Come see our Day of the Dead altar at Casa Guadalajara in Old Town! Join us for lunch or dinner then walk next door to Bazaar del Mundo, where we will be celebrating the occasion with more elaborately decorated altars, sugar-skull decorating and face painting. The event will take place Saturday, Nov. 1 from 10 a.m. to 8 p.m., and Sunday, Nov. 2 from 10 a.m. to 5 p.m. at Bazaar del Mundo, located next to our restaurant at the north entrance to Old Town, on the corner of Juan and Taylor Streets. This entry was posted by The Guadalajaran on October 30, 2014 at 4:03 pm, and is filed under Dia de los Muertos. Follow any responses to this post through RSS 2.0. You can leave a response or trackback from your own site.